Since then I have ordered two more mineral eye shadows, in ‘socialite’ and ‘temptress’. I really like the elf mineral shadow in natural. I decided to order it as I read on another blog (I can’t remember which one though, sorry) that it was a pretty good version of Stilla ‘Kitten’ eye shadow. Having had a bit of a play with the colour this afternoon, I have decided that the colour is lovely but it does need an eye-shadow primer or base to make it last. The picture below gives a pretty accurate image of the shade, a really pretty neutral with a gorgeous shimmer. 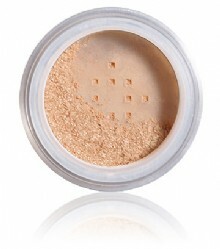 It’s an ideal base for all over the eye or as a highlight. I used the elf eye shadow brush to apply the shadow. This is the second one of these that I have bought as I loved the first one and thought having an extra was a good investment – especially when it was only £1.50. I do love a bargain. The mineral shadows are great value too, at only £3 a pot.